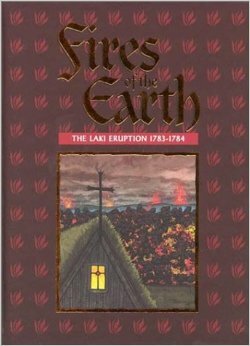 As I read Fires of the Earth, the translation of Jón´s account of the Laki eruption and its aftermath, I thought Keneva Kunze´s translation easy to read, although I know that given Jon´s religious position and the times, that the original must have presented serious problems to a translator. This book is only ninety-five pages. It attempts nothing beyond sharing the observations of Jón Steingrimsson in English.. Many North American Icelandic readers are unlikely to recognize Jón by his name but they would know who he was the moment his Fire Sermon was mentioned. We all have images of him defiantly preaching in his church as lava from Laki flowed toward it. Before this climactic moment, at least two other churches had been destroyed so everyone knew that the house of God alone was not enough to bring the calamity of the lava to a halt. “on the fifth Sunday after Trinity…I proceeded to the church, along with all of those people then in the Siða area who could manage to do so. I was filled with sorrow at the thought that this might well be the last service to be held in the church, as the terror which now threatened and approached ever nearer appeared likely to destroy it as it had the other two. He makes his sermon longer than usual, keeping everyone in the church. When he, at last, finishes his sermon, he and others went to see how close the lava was to them. They discovered that it had not advanced at all. “The rivers Holsá and Fjaðará poured over the dams which the new lava had made them, and with great torrents and splashing smothered the fire”. Jón´s chronicle of this time doesn´t stop with the eruption but goes on to describe the aftermath. Not many were killed by the eruption. The dying came because the feed for the sheep and cattle had been destroyed. To add to the misery, the animals suffer from some terrible disease, from rain that poisons everything and burns the leaves of plants and the skin of people and animals. Jón´s observations are detailed, his analysis intelligent. His bravery unquestioned. Iceland had a population of around fifty thousand people at the time of the eruption. Ten thousand died. That is one in every five. Jón reports on the desperation of people dying of hunger, dying from eating the flesh of the animals poisoned by the water and grass. The effects on the animals are grotesque. Jón names the farms that are destroyed, names how much each was worth before the eruption. These were prosperous farms. The owners were wealthy. After the eruption they became paupers. For people who don´t know Icelandic history, the term pauper isn´t terrifying. For those who do know, the word encapsulates forced removal, being sold to the person who will take the least amount from the sysla to keep them, to the loss of all rights until the debt is paid. Jón begins by describing the years of plenty before the eruption. Times were good. They were so good that people became greedy, uncaring, vain, proud. The abuse of alcohol became wide spread. By the end of 1784, they had all been chastised. Being reduced to eating your leather clothes does that to people. It is a shame that Fires of the Earth is out of print. It is a book that everyone of Icelandic background should read in order to understand their Icelandic ancestors and their current Icelandic relatives. 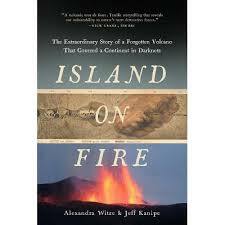 In conjunction with Fires of the Earth, I read Island on Fire (Pegasus Books) by Alexandra Witze & Jeff Kanipe. The authors make good use of their ability to look back in time and to use modern research to create a context for the Laki eruption. The authors are able to educate the reader by naming and explaining various eruptions around the world with their impact. The book is packed with interesting facts. For example, while I had heard of Krakatau, I’d never heard of disaster in Cameroon at Lake Nyos. There, volcanic carbon dioxide “slithered down the valley bottoms and suffocated at least 1,700 people in a single night.” It is because of gases like this that the authorities in Iceland keep warning people to stay well away from Barðabunga. The book begins with a description of the eruption of Heimaey in 1973. It is a well known eruption because the struggle to save the town and harbour were filmed. The authors make an interesting link between the people who struggled against the lava at Heimaey, using water to divert its flow and the observations Jón made about the effects of water on lava in 1783. Jón´s fire sermon and the stopping of the lava from Laki stopped before it reached him is known by every Icelandic person, young and old. Therefore, it wouldn´t be surprising if the firemen who decided to try to direct the lava flow got their idea from Jón. Island On Fire goes on to plate tectonics and Alfred Wegener and explains about how Wegener’s theories were ignored until Harry Hess of Princeton revived them in 1962. They touch on Hawaii and then back to Iceland and the mid-Atlantic rift where many of us have stood with one foot in Europe and one foot in America. We get brief descriptions of Hekla , Katla and Eyjafjallajökull and end with Grimsvötn. .In Chapter Six, “The Big Chill Laki’s global fallout”, we begin with Benjamin Franklin in France, suffering an unpleasant, foggy winter. He thought it might have something to do with the eruption in Iceland. It is noted that other scholars also noticed a connection between the winter weather and the eruption of Laki. From there we travel in the present to Denver, Colorado and visit the National Ice Core Laboratory. There the authors get to see an ice core with the volcanic dust from Laki. Chapter Nine is about how worried we should or shouldn´t be, although I can´t imagine what good worrying would do. If Yellowstone blows up, we´re all done. In the final chapter, the authors return to Heimaey and end by telling us the obvious. There´s no spiritual figure out there who is going to keep volcanoes from exploding. In spite of my grumpiness about some aspects of the book (I felt, at times, that it had taken its narrative strategy from TV specials or was hoping to become one),I‘d still recommend it for the general reader. It‘s well worth the price. However, if you can find a copy of Fires of the Earth read that, too, so you get a sense of the both the time and the terror.